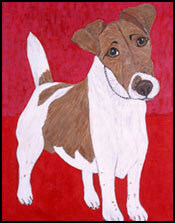 Commission your pet portrait now for the most extraordinary gift. 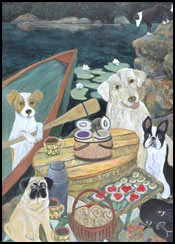 A charming acrylic portrait of your beloved pet will bring excitement to the room and joy to the heart. 1. In a envelope, include photos of your favorite pet(s), include close-ups and full body shots. Also helpful are photos of wall colors, fabrics, china, rugs, picnic baskets, the pool, the ranch house, or anything that will help capture the individuality of your surroundings. 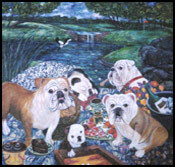 There were two photographs sent in order to create the commissioned painting. The client has a wonderful Australian Shepherd named Aussie; she asked to see Aussie sitting in their backyard on the green grass with the sailboats in the background. Note: Whiteout had to be used on the photograph in order to see the subject better. 5. When you call to discuss their idea of a painting; please keep in mind that I will begin the creative process and will be anxiously awaiting for the photos. This means that you will need to promptly get your pictures together and priority mail them to me so the flow of imagination will not be interrupted by a delay. This is the process of a commissioned painting;you can see the changes from the time it's started to the time it's completed. A very special surprise gift from a wife to her loving husband; Huey & Diana were commissioned to be sitting on the porch of their ranch house. Paintings are shipped in an architectural tube rolled up unless otherwise specified. This saves money on shipping. Once received take it to your local framer and have it stretched; the cost usually averages between $ 50.00 - $ 250.00. Your shipping cost will be added to the final payment. Call Meg Davis and speak with the artist about the photos needed for your special portrait.